This year I decided to make everyone Rosaries for Christmas. I was able to find some beautiful beads at a local bead store a few days before Christmas. Unfortunately, that was the last day the bead store would be open. They moved to a new location a little over 30 minutes from my house. I'm not too happy about it, since I was able to go to the bead store during the baby's naptime. She doesn't like being in a vehicle and cries whenever we go out. I won't be going there anytime soon. Luckily, Adrianna's college is right around the corner, so she can always stop by and pick up some supplies on her way home if I need any. These pictures don't do the beads justice. They are absolutely beautiful! We keep our Rosaries hung on a wall in our prayer room. A dear friend gave me a copy of this article dated October 8, 2008 from LifeSiteNews.com titled “Modesty in the Culture of Shamelessness” and written by Michael O’Brien. Below you’ll see a few lines from the article which is about 7 printed pages long. He's coming home tonight! Please continue to keep him in our prayers. This is one off the toughest weeks for him in his chemo treatment. His friend passed away last during the same treatment. Stop by Peggy's to see this week's Simple Woman's Daybook posts. Outside my window…Bright sunny day. The temperature is up in the 50's. Yesterday it was in the upper 60's. I can't wait until spring! I am thinking…I need to get dinner started. We're having company for dinner tonight. I am thankful for…the beautiful weather we're having this week. We don't have school, so the kids are spending a lot of time playing outside. From the schoolroom…off for another week. I am wearing…a very flowing light green skirt I bought at the thrift store Saturday morning. It looks like somthing from the 1800's. I am hoping…to go on a date with my husband this weekend. He has been spending all his free time finishing the basement. I am hearing…Silent Night playing in the background. Around the house…lots of new toys from Christmas. One of my favorite things…drinking coffee while reading Divine Intimacy and Liturgy of the Hours. A few plans for the rest of the week…Angela's God-mother is coming over tomorrow with a few of her children. We haven't gotten together since my birthday in September. A picture thought I'm sharing…my new haircut. I cut most of it off again. I'm in shock! This was totally unexpected. She asked me what I would like for Christmas and I told her that if she was going to get me anything, any kitchen gadget would be great. She completely surprised me yesterday. That was so thoughful and generous. It was actually my Step Father's idea. He told my mom he's been wanting to get me one for a long time, since we're always having computer trouble. I'm totally speechles!!! Johnny is our 17 year old neighbor. He has relapse adult Leukemia. He had Leukemia when he was 7 years old, but was cleared after 3 years of treatment. Last summer they found out the leukemia had returned and he's been receiving weekly treatments ever since. Tonight, Johnny is in the ICU with bleeding in the brain due to a possible bacterial infection and not enough platelets for clotting. He was admitted to the hospital with a very high fever, but it has now gone down to 102. Please keep him and his family in your prayers. Thank you for your continued prayers for Johnny over the past year and a half. 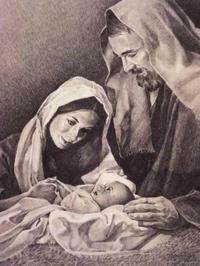 may you all have a most blessed Christmas. Comments open for his family to read. Outside my window…Bright sunny day, but very cold. I think the temperature is in the low 30's. I am thinking…I need to turn the heat on upstairs. I am thankful for…our local library. I can't keep up with all the books we checked out last month. From the schoolroom…off for the next two weeks. From the kitchen…Chicken Pot Pie from last night. I am creating…some hand-made Rosaries for Christmas. I am going…to enjoy having Adrianna home in the mornings. She's off school for the next 4 weeks. I am wearing…a long brown skirt, a red knit top and brown leather boots. I am hoping…the kids will do well during Christmas Eve Mass. I am hearing…The baby's soft breathing on my chest as I type this post. Around the house…Lots and lots of dust. The drywall is up and sanding has begun. One of my favorite things…spending time with my husband in the mornings while the kids are still in bed. A few plans for the rest of the week…Finish wrapping the rest of the presents. I ran out of gift wrap, so I'll have to run out sometime soon and get some. 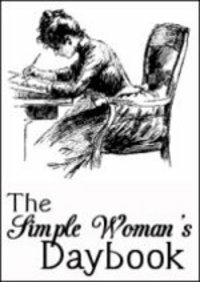 Comments Off on Simple Woman’s Daybook- Dec. 22nd. Comments Off on This porkchop is yummy!! !